What you notice first about the songs in Fun Home is that they're not entirely complete. That isn't to say that librettist/composer Lisa Kron's work—adapting the autobiographical graphic novel by Alison Bechdel—is somehow unfinished, but the thoughts and emotions in these songs bubble over with an inability to reach closure. Lines within songs are repeated, compulsively, almost mantra-like, willing things to be so; other lines stop short, the sentences never achieving resolution. Fun Home might not be the first or only musical about uncertainty and frustration, but those notions are built into the songs' very DNA. Salt Lake Acting Company's production of the 2015 Tony Award winner for Best Musical hits all of these notes in a way that builds to a powerful resolution, telling the story of 43-year-old Alison (Shawnee Kennington) as she reflects on her childhood and young adulthood. She wanders through flashback sequences exploring Small Alison's relationship with her closeted gay father, Bruce (Benjamin Henderson), and then her freshman year of college in the 1980s, as Medium Alison (Hailee Olenberger) begins her own process of coming out as gay. Dennis Hassan's versatile set—mostly representing Alison's beautifully appointed childhood home, and the way it becomes Bruce's way to find an environment he can control—allows for these three overlapping time lines to emerge clearly and distinctly, with spaces for simple but charming choreography by Penelope Marantz Caywood. 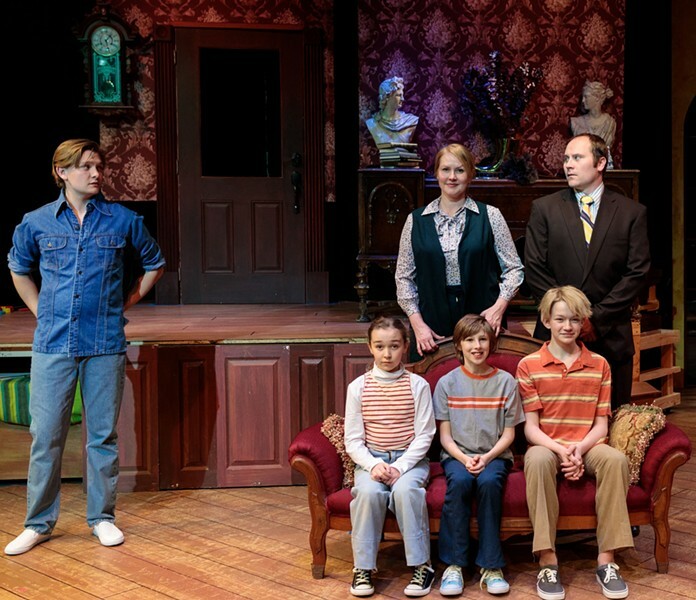 The cast gives splendid voice to the songs, including energetic work by the young actors playing Small Alison and her siblings (some young roles are double- or triple-cast). But mostly director Jason Bowcutt finds a way to keep the focus on the tangled emotions, whether it's through a comic moment like Medium Alison's coming-out anthem "Changing My Major" or a wistful recognition of missed opportunity in "Telephone Wire." The soul of the narrative is Alison's guilt that her father's suicide (revealed early on) came in part as a response to her own coming out, and realizing that he was trapped as much by the circumstances of when he was born as anything else. Kron's dialogue and lyrics dig deeply into the unspoken things that leave so many familial relationships and individual lives damaged or unresolved. As haunting as these songs are in what they say, they're even more devastating by emphasizing all the words that people just can't quite get out.